Coffee is such a staple in the American diet. From their a.m. wake-up call to their cup of decaf with dessert after dinner, Americans are drinking the stuff all day long. And while this miracle brew has been besmirched with old wives' tales that it'll stunt your growth (false, by the way), coffee, in truth, is brimming over with health benefits. Why the discrepancy? Dave Asprey, author of The Bulletproof Diet, explains that for coffee to be good for you, it has to be good coffee. "The studies on coffee and health go back and forth," he explains. "Some studies show health benefits, while others show negative impacts. This might seem confusing, but the reason is simple: Bad coffee is bad for you, and scientists don't differentiate between types of coffee when they run these studies." Asprey points out that coffee can be a major source of mold toxins, which come with their own set of negative health consequences. But some coffees are moldier than others. For instance, beans are cleaner than instant coffee. Fortunately, if you pick a good clean bean, you can enjoy these nine benefits of a healthy cup of joe. It doesn't get much simpler than this: Coffee reduces your chance of dying. According to research published in The American Journal of Epidemiology, four cups of coffee per day reduced the risk of death, from any cause, by 16 percent, and three cups per day reduced risk of death from cardiovascular disease by 21 percent. Research conducted at the Fred Hutchinson Cancer Research Center that found that drinking four or more cups of coffee per day reduced a man's risk of prostate cancer recurrence by 59 percent. One explanation for this finding is that coffee is loaded with antioxidants. "The richest source of polyphenols in Western diets by far is coffee," says Asprey. And previous research has shown that polyphenols can reduce the risk of the onset of prostate cancer. It's not just cancer of the prostate, either. A meta-analysis performed by Chinese researchers found that higher coffee consumption could reduce the risk of liver cancer by 50 percent, and another study by Canadian researchers found that high coffee intake was associated with reduced risk of breast cancer. 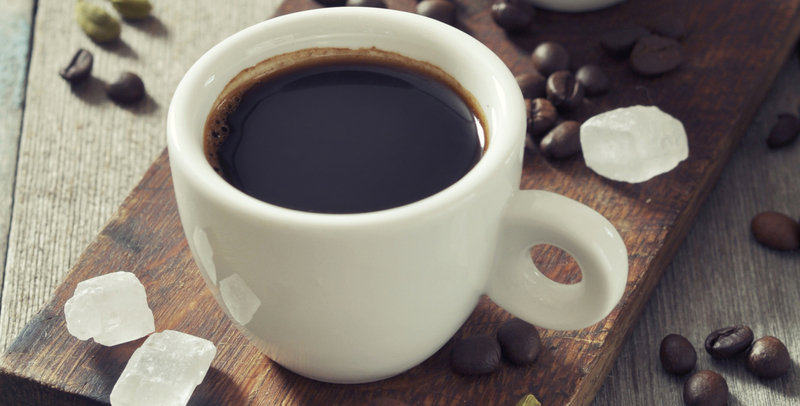 Coffee may be your new favorite diet food. First, Asprey points out, the polyphenols in coffee are a prebiotic for the good bacteria in your gut, a species called Bacteroidetes. This species of gut bacteria has been associated with thinness. "You can't increase the population of that species with probiotic capsules," he explains; "you have to feed it." Plus, the caffeine makes it thermogenic, meaning it helps you increase your resting metabolic rate and energy expenditure, leading to more calories burned. Coffee may help keep brain inflammation low, according to research from the University of Illinois. "We have discovered a novel signal that activates the brain-based inflammation associated with neurodegenerative diseases, and caffeine appears to block its activity," said Gregory Freund, MD, professor and head of the pathology department at University of Illinois. Reducing your brain inflammation is proving to be a critical way to prevent age-related cognitive decline and neurodegenerative diseases, which may explain why in previous studies coffee seemed to protect against Alzheimer's disease. While it's true that caffeine withdrawal may contribute to headaches if you overdo it on the java, drinking coffee regularly (though moderately) can reduce your risk of chronic headaches, found researchers in Norway. They found that those who drank 241 to 400 milligrams of caffeine (equivalent to two to three cups of coffee) regularly had the least number of headaches. Those who drank the least coffee (less than 240 milligrams of caffeine) had the highest instances of chronic headaches (more than 14 days per month with a headache). "The caffeine in coffee binds to receptors for neurotransmitters associated with your mood," Asprey says. This may explain why coffee doesn't just give you a burst of energy, it may also brighten your day. According to a study from The Archives of Internal Medicine, women who drank at least four cups of coffee daily were 20 percent less like to become depressed. Harvard researchers found that drinking an extra cup a day for four years decreased the risk of diabetes for coffee drinkers in their study by 11 percent compared to those who didn't change their coffee drinking habits. Surprisingly, the inverse was also true: Decreasing coffee consumption increased people's risk by 17 percent. They do point out, however, that the coffee was served black or with just a little milk and sugar. Making that a sugar-jacked cup of java is not a good way to stave off diabetes. "Caffeine also increases insulin sensitivity in healthy humans, which is extremely important to sustained weight loss," Asprey adds. Coffee isn't usually thought of as a detox drink, but research has found that not only does coffee lower abnormal liver enzyme levels, but it can even reduce your risk for cirrhosis, a liver disease. Drinking two or more cups of coffee per day reduces your risk of death by cirrhosis by 66 percent, according to research published in Hepatology. Interestingly, tea, fruit juice, and soda consumption don't affect cirrhosis mortality; only coffee does. Every body part wants to get in on the benefits of coffee, and the heart is no exception. A meta-analysis published by the American Heart Association's journal, Circulation, found that those who drank three to five cups per day had the lowest risk for cardiovascular disease. In fact, a separate analysis published in The Central European Journal of Medicine found that light coffee consumption reduced the risk of stroke by 10 percent; moderate consumption, by 14 percent; and heavy consumption, by 17 percent in men. Coffee have one more health benefits. Higher coffee and caffeine significantly lower incidence of Parkinson's disease. Best Coffee Brands. I also made a post here titled "Top 5 foods to consider when quitting coffee" Check it out and let me know what you think!